The Blades (Amity/Cheshire/North Haven) girls’ ice hockey team hosted the Branford Hornets in Hamden today, Saturday, Feb. 2, at 3 p.m. The first period belonged to the Blades. Andrea DelVecchio opened the game with a goal, assisted by Shannon Reilly and Haley Cable. Ilana Leynar then shot one in, assisted by Nadia DiNatale and Hanna Sosensky, which was followed by Meaghan Hogan’s solo goal. 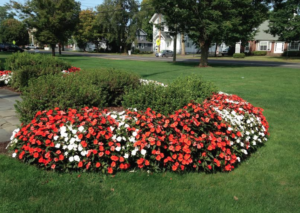 Branford stepped up in the second period. Meagan Montenaro made an unassisted goal for the Hornets, and then she assisted Emma Sheehan when she scored. The Blades owned the third period with DelVecchio netting a hat trick. The first goal was assisted by Reilly and Cable, the second by Reilly. Saves: Both Goalies worked tirelessly. Caitlyn Ranciatto made 24 saves for the Blades. Christina Meadows made 22 Saves for the Hornets. 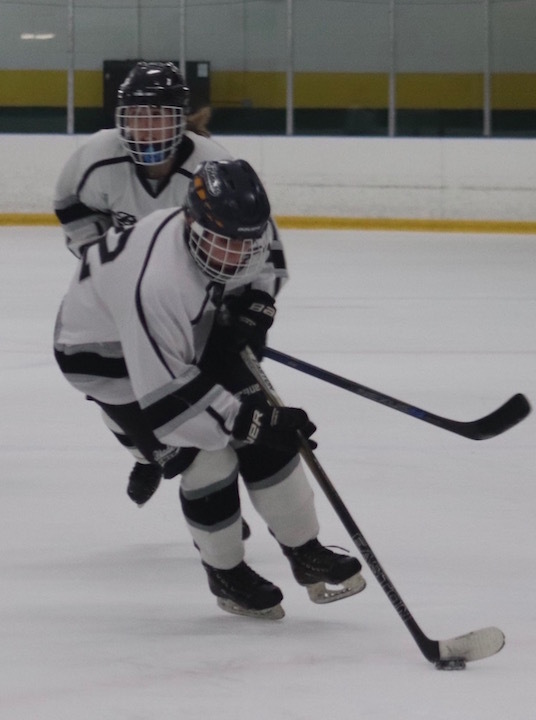 Next Up For The Blades: The girls are away at the Northford Ice Pavilion on Wednesday, Feb. 6 for a matchup against Hand-Coginchaug-Old Lyme at 8:30 p.m. 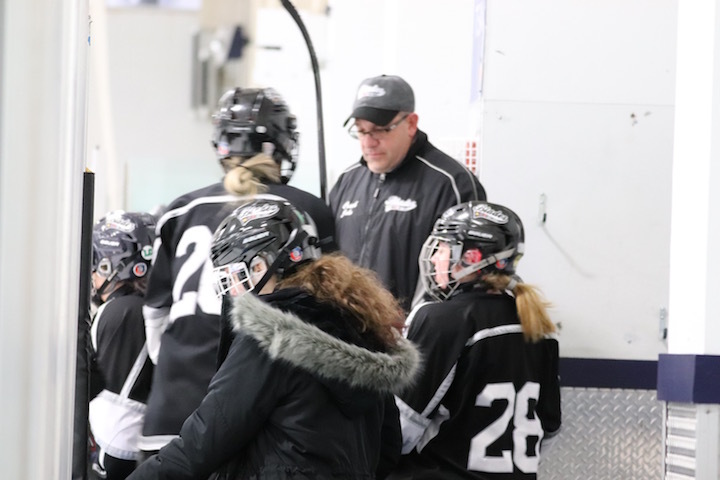 The Blades (Amity/Cheshire/North Haven) Girls Ice Hockey team was on the road in Shelton on Wednesday afternoon for a game against Notre Dame – Fairfield. The first period had a lot of excitement Notre Dame scored first, then, the Blades’ Andrea DelVecchio tied it up at 1. Notre Dame came back with a second goal, followed by Blades’ players Caroline Cadelina and Shannon Reilly each scoring unassisted goals. The Blades dominated the third period with three goals. First Sara Cable, assisted by Cadelina; next Reilly unassisted; and then Nadia DeNatale, assisted by Meaghan Hogan. Final Score: Blades 6, Notre Dame 4. Next Up for the Blades: A Home game against Guilford at the Hamden Ice Rink on Saturday, Jan. 26 at 2 p.m. If you’d like to see the girls play closer to home, come to Bennett Rink in West Haven on Tuesday, Jan. 29 at 5:30 for a match up against the super tough Sacred Heart Academy (10-2). The Blades Girls Ice Hockey Team (Amity/North Haven/Cheshire} won its second consecutive game of the season on Saturday night in Hamden. The girls went up against Daniel Hand at 8 p.m., and immediately showed what they were made of. In the first period, Haley Cable was first to score, assisted by Andrea Delvecchio and Shannon Reilly. Then Caroline Cadelina and Nadia DiNatale each made unassisted goals, pushing the Blades’ lead to 3-0. Not to be outdone, Hand’s Anna Sather put her team on the scoreboard, assisted by Lindsey Orlando. When the girls returned to the ice, they still had that fighting spirit, DelVecchio widened the margin with an unassisted goal. Then Sather, assisted by Lucy Brown scored for Hand, bringing the score to 4-2 (Amity). The third period began with Hand’s Sather getting a hat trick with an unassisted goal. The Blades answered with Cable’s second goal, assisted by Tess Csejka. Sather came back for her fourth goal, assisted by Grace Lavin to bring the final score to 5-4 (Blades). Both of the goalies were kept on their toes in this game. Caiylin Ranciato made 21 saves for the Blades, and Hand’s Megan Hart made 24 saves. Team Records: Blades 2-7, Hand 0-5. Next Up for the Blades: Today, Jan. 6, Girls Ice Hockey vs Masuk-Barlow-Newtown-Lauralton Away at The Rinks at Shelton at 4:30 p.m. 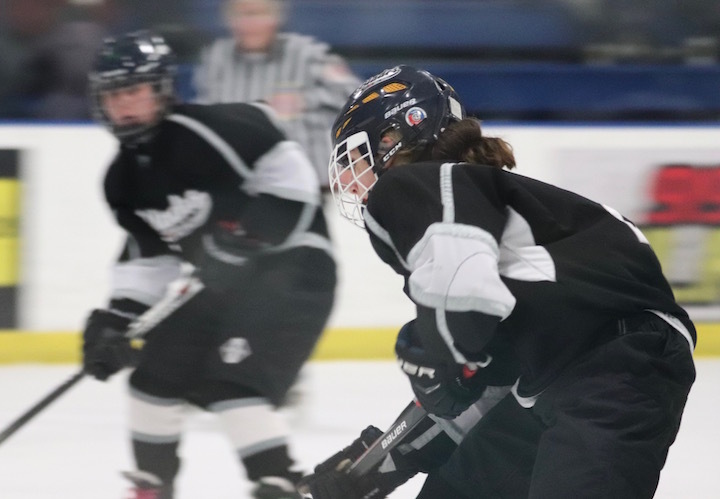 The 2018 portion of the 18-19 season was not kind to the Blades Ice Hockey Team, but the first game of 2019 gave us a glimpse of the Amity/Cheshire/North Haven girls that we’d grown accustomed to in past years. On Wednesday, Jan. 2, the Blades were on the road in East Haven for a match-up against Branford. The first period belonged to the Blades. Tess Csejka was first to score, then Haley Cable made a goal — both were unassisted. With a two point lead, the Blades came out strong in the second period. Cable scored on an assist from Hannah Sosensky. Then Branford fought back, Molly Donegan put her team onto the scoreboard on an assist from Meaghan Montenegro. Donegan scored again, assisted by Ashleen Keating, narrowing the score to 3-2 (Blades). But that wasn’t the end of the second period, Meaghan Hogan slapped in a goal assisted by Andrea Delvecchio. Then it was Delvecchio’s turn to score on and assist from Csejka. The Blades had a very impressive third period, too. They came back out to the ice on fire. Delvecchio made an unassisted goal. Branford’s Sophia Caturani answered with an unassisted goal of her own. The high point was when Delvecchio got a hat trick, assisted by Csejka and Cable. Rounding out the game was Csejka making the final unassisted goal for the Blades very impressive 8-3 victory. Blades goalie Caitlin Ranciato did a fine job keeping Branford at bay throughout the game. Congratulations to the Blades and coach John Peschell on your first win of the season, now keep it going! 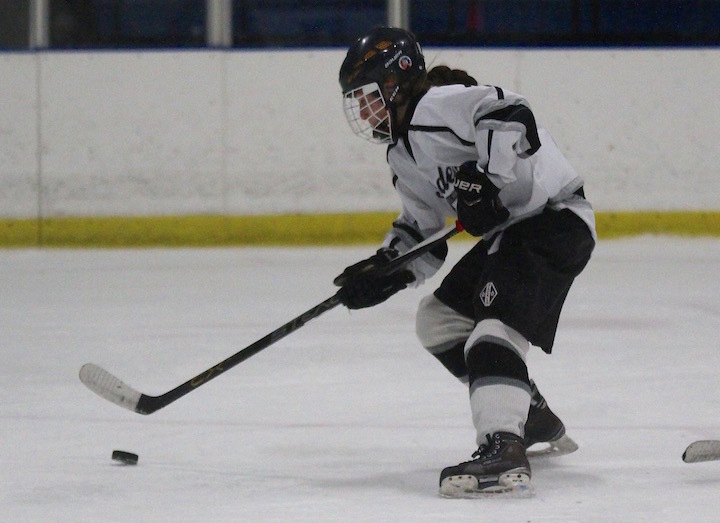 The Blades Girls Ice Hockey team (Amity/North Haven/Cheshire) was on the road in East Haven on Saturday, Dec. 15 for a game against the always strong Guilford team. In the first period, the Blades’ Caroline Cadelina put her team up on the board first with an unassisted goal. Guilford’s Danialla Vickerman tied things up on an assist from Jacquelyn Violette and Madison Epke. Then Lily Mackey pulled Guilford into the lead assisted by Sydney Miles. The Blades’- Haley Cable narrowed the score on an assist from Shannon Reilly and Mia Dow. The Blades battled in the third period, determined not to lose this matchup. Andrea DelVecchio made a goal assisted by Meaghan Hogan and Shannon Reilly, bringing the score to 4-3, but that was the best they could do. The Blades lost to Guilford. Blades Goalie Caitlin Ranciato worked so hard and made a difference. The Blades next game is on Wednesday at their home ice – Hamden Ice Rink at 8 p.m. They’ll be playing West Haven – SHA (2-0 both of which were shutouts). 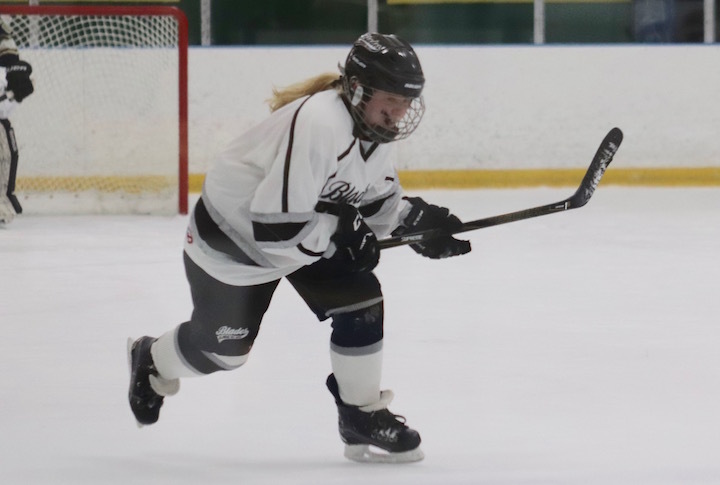 The Amity-North Haven-Cheshire Blades Girls’ Ice Hockey team was on the road in Milford for a matchup against the Lauralton Hall Crusaders on Saturday evening. Lauralton’s Kerry Ullman, assisted by Lucy Schumann scored the first goal in the first 3:06. Just 21 seconds later the Blades answered with Melissa Montesi getting one in, assisted by Maryssa Racino and Olivia Dittman. Schumann/Ullman broke the tie at 4:52 and with just 3:45 remaining in the first period, our Tess Csejka made an unassisted goal binging the score to 2-2. The second period belonged to the Blades. Just 1:04 after entering the ice, Shannon Reilly scored on an assist from Nadia DeNatale; Montesi/Dittman got the team’s fourth goal at 10:46; and Montesi scored again at 4:41k this time on an assist from Meghan Hogan. Score 5-2 Blades. The Blades got a quick start in the third period when Jena Casman hit an unassisted goal at 11:46. Shannon Reilly scored off an assist from Nadia DeNatale 90 seconds later. Melissa Montesi brought the score up to 8-2 on an assist from Sara Cable at 7:53. Lauralton’s Ullman/Schumann) added a point one minute later. Amity’s Grace Kosh scored the final goal for the Blades on assists from Melissa Montesi and Shannon Reilly at 4:33. 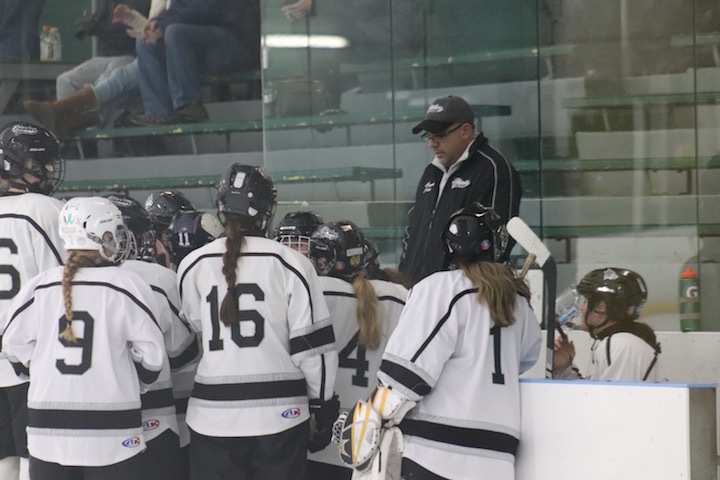 The Blades Girls’ Ice Hockey team (Amity, Cheshire, North Haven) hosted the Crusaders from Lauralton Hall at the Rinks in Shelton Wednesday night. The Blades grabbed an early lead with Nadia DeNatale (11) making the first goal just 2 minutes and 10 seconds in at 12:50 in the first period. Then, at 7:19 DeNatale got another one in, this time assisted by Shannon Reilly. A minute and a half later, Shannon Reilly scored, assisted by Bailey MacNamara. This was followed by a fourth Blades goal by Tess Cesjka, assisted by Jackie Howlett. About 90 seconds later, Lauralton got onto the scoreboard bringing the score to 4-1. With just 30 seconds remaining in the first period, and Tess Cesjka got one past the Crusaders’ Goalie. First Period score 5-1 – Blades. Back on the ice, Tess Csejka (2) scored an assisted goal, then, four minutes in, Kiley Degrand (7) got one in, assisted by Bailey MacNamara (10). At 4:36 Lauralton scored an unassisted goal, bringing the score to 7-2. The Blades’ Melissa Montesi scored on an assist from Kyla Delvecchio. At 11:19, the Blades scored again with Kiley Degrand’s goal on assists from Hannah Sosensky, and Bailey MacNamara. An unknown Lauralton player scored an unassisted goal at 4:36. The Blades outshot Lauralton 25-7.